Have a safe Memorial day, all. If you’re not in the States, Memorial day is the day we honor those who’ve died serving our country. It’s also the day many visit the final resting places of loved ones, go to parades and have get togethers around the grill. Here, Memorial day is really the unofficial “official” start of summer. 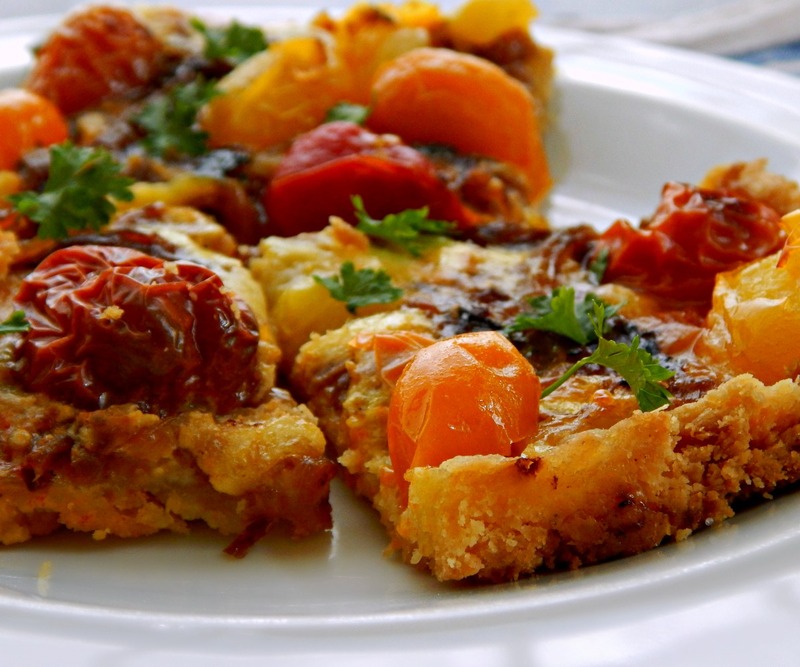 All I know about today is we’ll be having this glorious Oven Roasted Tomato Tart. The rest we’ll play fast and loose because when I’m helping out my favorite octogenarians (the folks – although one is 90, now) I never really know what the day will hold. They’ll be cooking up some adventure of their own and I’ll be dragged along! That’s ok, though, because this tomato tart (which I made yesterday and might make again this week – it’s that good. I mean it’s really, really good) is great warm, at room temperature and cold. I love that it’s an appetizer that’s just a little unexpected and I love that it’s a little rustic with just a touch of sophistication. Oven Roasted Tomato Tart is perfectly portable, too, just in case you’re invited somewhere. Just tote it along in the pan and slice it on the spot. The tart crust is sturdy and this can be sliced large or small for picking up and noshing. This tart has a super easy pat in the pan crust, thanks to Better Homes & Gardens. If you’d rather, make this with a pie crust, this crust I used for my Caramelized Onion Galette, or a premade pie crust – or maybe a thin layer of pizza dough. Choose what fits your time-line and skills. Give it a little head start in the oven, then add your scrumptuous layers. First, add a little cheese, maybe several. Something melty and something sharp. Then strew with caramelized onions and drizzle on the thinnest layer of a little custard made with egg and milk to hold everything together. Top with tomatoes – glorious cherry tomatoes in any and all colors you can find. Start caramelizing the onions first so they can be cooking as the tart crust is prepared. You may have extra caramelized onions. In a food processor pulse flour, butter, and salt 10 to 20 seconds or until mixture looks like fine crumbs. Do not over process. In a small bowl whisk together yolks and the water. With processor running, add yolk mixture. Stop as soon as dough just starts to come together, about 5 seconds. Crumble to distribute evenly in an 8 x 11 rectangular sheet pan or 9 to 11-inch round tart pan with removable bottom; press into pan. Using a fork, prick dough all over. Bake 12 minutes. Remove from oven and assemble the tart. 1-1/2 cups grated melty cheese: provolone, mozzarella, jack, colby jack, etc. Heat a skillet over medium-low heat. Add the butter, onions, salt, and pepper and cook for about 10 minutes, covered, stirring now and then. Uncover and cook, stirring more often, about 15 minutes more until the onions are soft and deep golden brown. Set aside. Remove tart crust from oven. Sprinkle on the cheeses, then strew the onions (as many or as few as you’d like – I prefer fewer so they don’t overwhelm the tomatoes) on top in a single layer. Mix together the egg and milk in a small bowl and drizzle over the onions on the tart. Nudge it around just a little to spread throughout, trying to disturb the cheese as little as possible. It may not completely cover. Add cherry tomatoes to the top; any cut tomatoes need to go on cut side up. Bake the tart for 15 to 18 minutes, watching carefully to make sure the crust doesn’t burn; it should be a deep golden brown so if the crust browns too fast, reduce the heat to 425 F. When done, some of the tomatoes may have burst, others should be wrinkly – a few browned spots are perfectly fine. Remove the tart from the oven and allow it to sit for 5 minutes. Sprinkle with salt, add herbs. Serve with vinegar of choice. I’m taking this recipe over to Fiesta Friday 173, put on this week by the intrepid beach comber, Angie and her two co-hosts: Lindy @ Love In The Kitchen and Paula @ Her Life Is Love. I’m sensing love in the air, this week. It just takes a second to click over and visit and see all the great link-ups & give them some love back. This entry was posted in Click here for Fabulous Food Posts and tagged Appetizer, Better Homes & Gardens, Cheese, Cherry Tomatoes, Frugal Hausfrau, no-fail tart crust, Tart, tomato tart, Tomatoes. Bookmark the permalink. You know I am going to have to make this… though I will probably throw some cornmeal in the crust since you have me hooked! Have a lovely week! lol, Carlee, you too! We have company this week so I’m going to have to stop by and catch up with your postings! This looks delightful, although I probably can’t handle all the cheeses in the filling at this moment. I like easy recipes, so this sounds great! Thanks for joining Fiesta Friday! I don’t think it would do much harm to cut the cheese WAY back…it’s nice to have a little layer so the tomatoes don’t make it soggy. I think I ate nothing but oatmeal for most of my first trimester with my daughter! I was soooo sick. I lost my breakfast so often I literally couldn’t eat eggs for nearly 25 years…Thanks for so graciously co-hosting FF this week! And congrats again! Hi Eartha! I feel the same way! When/where I grew up, I don’t think anyone had every heard of caramelized onions – or if they did, it happened by accident and they were probably dumped out to start over, lol! I know, right! How on earth did we get by without the internet!!?? Another fab recipe! A great way to use fresh ingredients. Me either! Love fresh veg right out of the garden. Caramelized onions are always so much fun to make. This looks amazing. The crust looks, easy, too. I admit to being still a bit intimidated by pastry dough, but I could probably do this. I’ll report back. My word that tart looks good!!!! Elaine, I think this is one of the best things I’ve made in ages. I had a piece before bed…lol! Everyone else had ice-cream. I had a piece of this tart!